It’s summer before eighth grade, and Cooper Wilder is looking forward to fishing, camping, and kayaking with his summer pals Packrat and Roy. The three white boys get more than they planned when a mystery arises. Someone is dumping bag upon bag of trash in a field near Cooper’s family’s campground. The boys set out to catch the culprit. Is it someone local or a summer person? 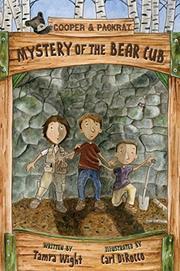 The book’s title is a misnomer; the mystery of the bear cub is flimsy. It’s unusual that no one, not even the local warden, makes a connection between the apparently orphaned baby bear and the fully grown female that’s been going through the trash in town. The mystery of the bears’ separation doesn’t come close to being mysterious—it doesn’t appear on the boys’ radar until they find out how the bears were parted. Sense of place is well-established, and the author’s love for the forests and wildlife of Maine is evident in every detail of the environs. Readers familiar with the Maine woods will recognize it, while those who aren’t will feel like they’re visiting for the first time. Each chapter opens with a bear fact, and the author’s note includes a list of common trash items and their decomposition time.